Walter Neary explaining the genesis of the latest work by he and fellow author Steve Dunkelberger. 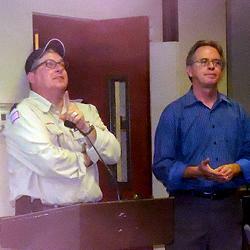 Steven Dunkelberger (left) joins fellow author Walt at the podium. Let’s see now: there’s Images of Lakewood, and Legends of Lakewood. What’s next by authors Steve Dunkelberger and Walter Neary? These prolific writer/historians are doing yeoman work generating interesting, dynamic histories about this area. 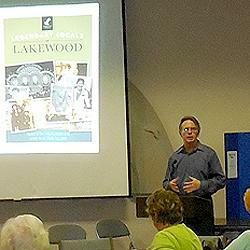 The men recently presented a program about their newest book at Lakewood Historical Society’s September meeting. As Neary said at an earlier program in Lakewood, when he came to the area more than two decades ago, there wasn’t anything about Lakewood on the shelves. Now there are two books, and hopefully there will be more. This latest tome features people aspects of Lakewood such as stories about the Fabulous Wailers and the Sonics, and Steamship owner H. F. Alexander. There’s so much more, but you’ll have to get your own copy to read. Copies of their new book, Legends of Lakewood are available at the Lakewood Historical Museum, as well as at Barnes & Noble in the Lakewood Towne Center. No excuse not to know about the area where you live. Watch for their next book—no date as yet, but you can be sure it will be filled with amazing information.